China’s President Xi Jinping calmed trade war fears Tuesday morning, promising to open China's economy and lower tariffs on imported goods. - U.S. oil production growth has mostly come in the form of light, sweet crude, with API gravity of 35 or higher, and sulfur content of 0.3 percent or less. 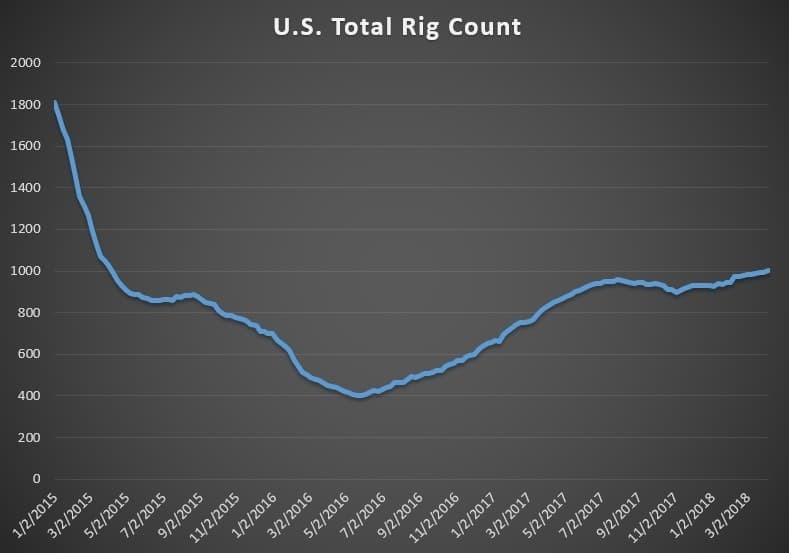 - The EIA estimates that 90 percent of the 3.1 million barrels per day of supply growth since 2010 has come from light sweet sources, such as in the Bakken, Permian and Eagle Ford. - Medium-gravity (API between 27 and 35) come mostly from Alaska and offshore Gulf of Mexico. - Light sweet crude will also dominate future growth, and its share of the pie will expand from 56 percent in 2017 to 70 percent by 2050. • Schlumberger (NYSE: SLB) is the most vulnerable oilfield services firm to new U.S. sanctions on Russia, although its business there still amounts to less than 10 percent of sales, according to Barclays. • BP (NYSE: BP) announced its first final investment decision of the year, greenlighting the second phase of the giant Khazzan tight gas field in Oman. Kinder Morgan suspends work on Trans Mountain Expansion. In a major blow to Canada’s oil sands industry, Kinder Morgan Canada (TSE: KML) announced that it would suspend all non-essential work on the Trans Mountain Expansion, and would ultimately scrap the project entirely if regulatory concerns could not be addressed by May 31. KML’s share price fell by as much as 19 percent on Monday. 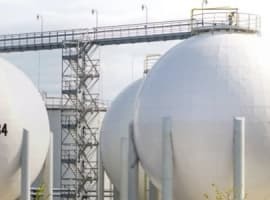 The expansion would add 590,000 bpd of takeaway capacity from Alberta’s oil sands and remains the most important midstream project for the entire industry right now. However, despite the backing from the federal government and the provincial government of Alberta, British Columbia has held up the project. Alberta’s Premier floated the idea of taking a direct stake in the project in order to push it forward. If the project fails, the midstream bottlenecks for Alberta’s oil industry will likely persist for years. Net-length in oil futures reaches extraordinary heights. Hedge funds and other money managers have amassed bullish positions in oil futures since the end of 2017. However, while long bets have remained elevated, the shorts have liquidated more recently, pushing net-length even higher. The buildup is mostly occurring in Brent, as opposed to WTI. The bullishness is a sign of optimism regarding the trajectory of oil prices, but it also represents a significant risk, exposing the oil market to a price correction if sentiment sours. Exxon and Qatar in talks on U.S. shale. The WSJ reports that ExxonMobil (NYSE: XOM) and Qatar are in talks that could result in Qatar taking a stake in U.S. natural gas assets. The proposal under consideration would take the form of a joint venture, with Qatar working with Exxon subsidiary XTO Energy on shale gas drilling. 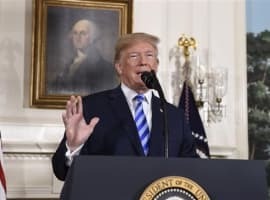 The partnership would serve Qatari objectives – finding energy investments abroad while also improving the geopolitical relationship with Washington, which it needs in order to fend off regional rivalries with Saudi Arabia and UAE. For its part, Exxon could use Qatari investment to get the Golden Pass LNG project off the ground in Texas. Qatar Petroleum already owns a stake in the project but has declined to invest in it until it has control of U.S. natural gas assets upstream. China balks at Saudi price increase. Saudi Arabia increased the price of its crude heading to Asia, but instead of swallowing the price hike, Chinese refiners are responding by reducing purchases. Sinopec, Asia’s largest refiner, will cut back on Saudi oil imports by 40 percent in May, according to Reuters. The move suggests Asian refiners no longer feel beholden to Saudi oil, and are confident they can find supplies elsewhere. If Sinopec and others are able to easily swap out Saudi oil, it also suggests the oil market is not as tight as some think. U.S. oil exports jump above 2 mb/d. U.S. oil exports surged to 2.175 mb/d in the last week of March, up nearly 30 percent from the prior week. High U.S. exports could spoil the oil price rally. Tom Kloza, co-founder of Oil Price Information Service, argues elevated shipments from the U.S. are more than offsetting declines from Venezuela and Mexico, and ultimately could keep the market well supplied. "We think that number is going to go up to probably 20 million or more [a week], get to maybe 2.5 million barrels a day," Kloza told CNBC. "The United States is in essence going to be exporting more than the United Arab Emirates, Kuwait, Nigeria, those individual countries." IMF: ExxonMobil’s Guyana deal was too favorable. In a new report, the International Monetary Fund said that ExxonMobil (NYSE: XOM) received such a favorable deal from Guyana that it demonstrates the need for a rewrite of the tax laws in the small South American nation. The IMF said that while Guyana should honor the agreement with Exxon, it should also overhaul its laws in order to take a larger slice of the proceeds in future oil deals. Exxon has prioritized development of Guyana’s offshore oil fields, but up until now, the country has little experience in such deals or negotiations. The government’s take, according to the IMF, is below international norms. Related: Does Conoco Know Something That Its Competition Doesn’t? U.S. sanctions send Russian stock market plunging. Russian stocks plummeted on Monday after a new round of U.S. sanctions related to election interference. The Moex index fell by nearly 9 percent on Monday, the sharpest decline since Russia’s invasion of Crimea four years ago. The ruble also sank on the news. Total SA and Aramco ink $5 billion petrochemical deal. Saudi Aramco and Total SA (NYSE: TOT) signed a $5 billion deal to build a massive petrochemical complex at their 440,000 bpd Jubail Satorp refinery in Saudi Arabia. The announcement comes as Saudi crown prince Mohammed bin Salman visits France. Trump admin to streamline infrastructure permitting. More than a dozen federal agencies agreed to cut the time it takes to move a major infrastructure project through the permitting process. Rather than conducting reviews sequentially, the agencies will review permits on a project concurrently in order to speed up the process. It’s funny how almost any excuse will serve to push oil prices higher. Never mind the fact that there is plenty of oil sloshing around the world, US production continues to leap, & OPEC/Russia have to idle more & more capacity. 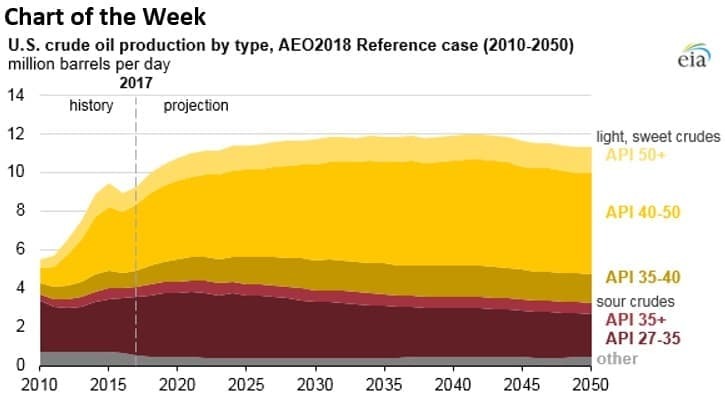 At least w WTI over $65 US prosecution will continue to rip & renewables have a huge window to continue to grow market share while cutting cost.